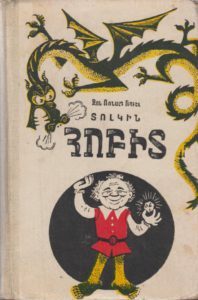 First edition of The Hobbit in Armanian language, 1984. Sovetakan Grogh Printing House, hardback no dust jacket issued, 301 pages, no ISBN, cover and illustrations by M. Belomlinskiy. 13,3 x 20,5 x 1,9 cm. Weight 342 grams.